In the morning of July 7, 2009, the academic report of which the title is “Taiwan's Food Security Status and Multi-stage Mass Spectrometry Detection Technology Application" is reported by Professor Li Maorong, Board Chairperson of Taiwan Society for Mass Spectrometry in the report Hall of the Shanghai Institute of Organic Chemistry. The report was presided by Researcher Guo Yinlong, Director of Analytical Chemistry Office. 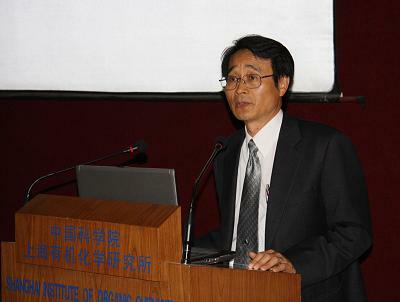 Guo Yinlong thanked Professor Li Maorong for his coming to the Shanghai Institute of Organic Chemistry and doing of the report, and gave a brief introduction on Professor Lee's experience and research; more than 90 experts and scholars of and out of the Shanghai Institute of Organic Chemistry attended the report. Professor Li Maorong now is Director of the Department of Chemistry of National Chung Hsing University in Taiwan, Board Chairperson of Taiwan Society for Mass Spectrometry. Professor Lee's study range is wide; mainly use the Mass Spectrometry technology such as the characteristic development of GC-MS, LC-MS, GC-MS/MS and LC-MS/MS to apply to the trace quantity analysis research of the food safety, environmental science, clinical science, medicolegal science, etc., such as the detection of the trace quantity residual pesticide in the food and environmental samples, the identification of the pesticide decomposition structure and the research of the distribution situation, the detection of the human blood in the pharmacology and trace quantity medication in the urine and the structural identification of its metabolites; in the physical chemistry to use the mass spectrometer to explore the characteristics of the gas phase ion, carry out the researches of the reaction mechanism, ion-molecule reaction and proton affinity, etc..
After the report, part of the participants visited the "Shanghai Mass Spectrometry Center" of the Shanghai Institute of Organic Chemistry under the researcher Guo Yinlong’s accompany and further understood the instrumentation and scientific research effort of the Mass Spectrometry Center.